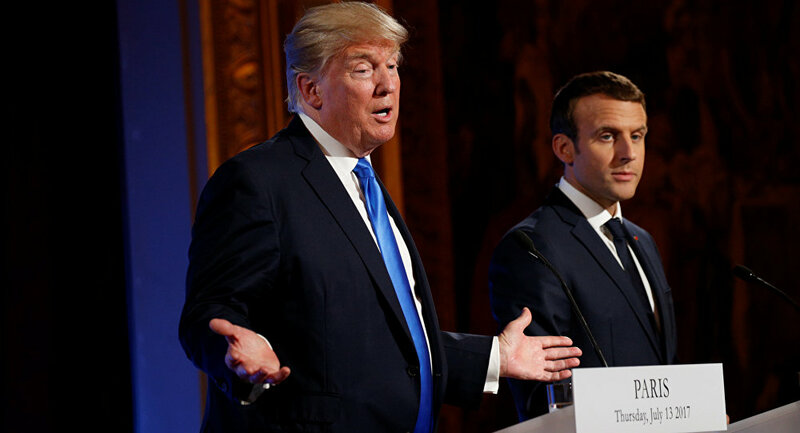 WASHINGTON (Sputnik) - US President Donald Trump in a statement just minutes after landing in Paris said it was very insulting of French President Emmanuel Macron to suggest that Europe should build its own military to protect it from the United States, Russia, and China. "President Macron of France has just suggested that Europe build its own military in order to protect itself from the US, China and Russia. Very insulting, but perhaps Europe should first pay its fair share of NATO, which the US subsidizes greatly!" Trump said in a Twitter message on Friday. According to media reports, Macron has advocated for mobilizing a European military force since his election last year, but brought it up again while touring World War I memorials on Tuesday. Trump appears to have been responding to Macron's Tuesday statement that a "real European army" would protect the continent "with respect to China, Russia and even the United States of America… We will not protect the Europeans unless we decide to have a true European army." French Armed Forces Minister Florence Parly said Thursday that the potential EU joint military force could be used for tackling the consequences of natural disasters, for providing humanitarian assistance and in military operations. Trump has called NATO obsolete, but said after the alliance’s summit in Brussels in July that the alliance is becoming strong again because of his efforts to hold member states accountable with respect to their defense spending commitments. Trump also said during a bilateral breakfast with NATO Secretary-General Jens Stoltenberg in July that many alliance members have not been contributing enough for years. The president's statements sparked a wave of criticism from US lawmakers, who argued that Trump should display more commitment toward European allies in light of growing threats from Russia, China, and other countries. According to NATO estimates issued earlier in July, in 2018, only five out of 29 NATO members – Estonia, Greece, Latvia, the United Kingdom and the United States – will spend 2 percent of their GDP on defense, the target set by the alliance. Macron has been long advocating for EU’s greater military autonomy. He has also maintained that France could not rely on the United States when it comes to the European security. However, some prominent military experts doubt that EU countries could create an effective defense structure. In particular, a 1952 treaty established a European defense community, which never came into being. Other efforts were limited to one-off operations, like the Franco-German Brigade, which took part in the conflict in Bosnia and Herzegovina in 1996 and in military campaigns in Afghanistan. Trump is in France to commemorate the 100th anniversary of the end of World War I. The massive celebrations in Paris will be attended by a number of foreign leaders, including Russian President Vladimir Putin. On November 11, 1918, Allied supreme commander Marshal of France Ferdinand Foch, UK First Sea Lord Admiral Rosslyn Wemyss and German chief negotiator Matthias Erzberger signed an armistice in the Forest of Compiegne that ceased hostilities in World War I. The peace treaty was signed on June 28, 1919, in Versailles.